These two sisters have had two whole weeks together. It has been 90% lovely and 10% bickering and arguing. Last week, i took Elle to London for the day and Mia stayed at her Nana's house for a sleepover for the first time on her own. When we took Mia up to the house for her sleepover, Elle cried because she didn't want to leave her sister. She cried in the car all the way home and spent the whole next day asking for her. As soon as we returned from London, there was a running hug movie kind of scene! Elle picked her up and spun her around whilst Mia gave her one of her squeezy cuddles. They hate being apart from each other. It really makes me emotional to see them together. They call each other best friends. The time has come where, after bedtime, they go into each others rooms not knowing that i can hear them running around or giggling together. It actually reminds me of being little. Me, my sister and brother would go in each others rooms and we would hear a "get to bed" from downstairs and we were always amazed at how mum knew we were out of bed! I find myself doing the same. Standing at the bottom of the stairs and saying "bed" in a firm voice and i see one of them whizzing across the landing to run back into their room for it to happen again only 5 minutes later. We have thought about letting them share a room because Elle is always asking but Mia isn't a great sleeper. We are hoping that when she starts school in September, that she will start to sleep through the night and then we might consider allowing them to share together. Both girls are so excited for Mia to start school. 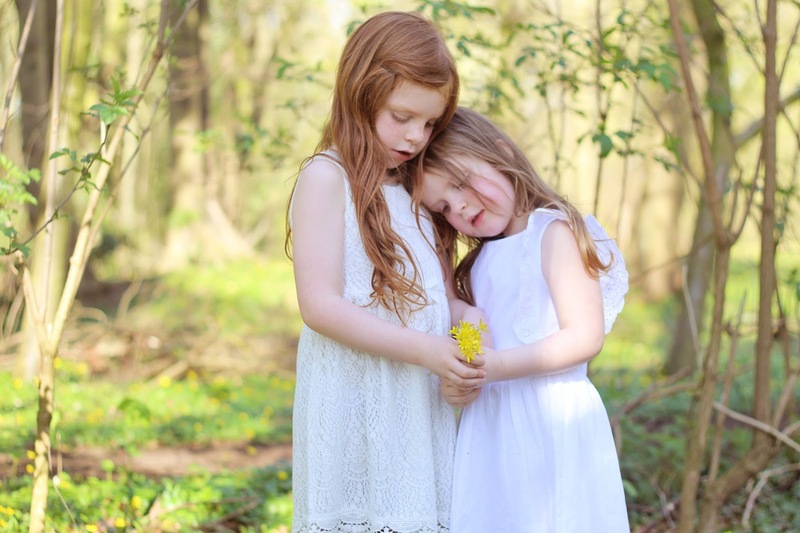 They will share a playground and Elle is always talking about being excited to play with her at lunchtimes and playtimes and seeing her in assembly. I know that Elle will look out for her sister and they will continue to be the best of friends even at school. 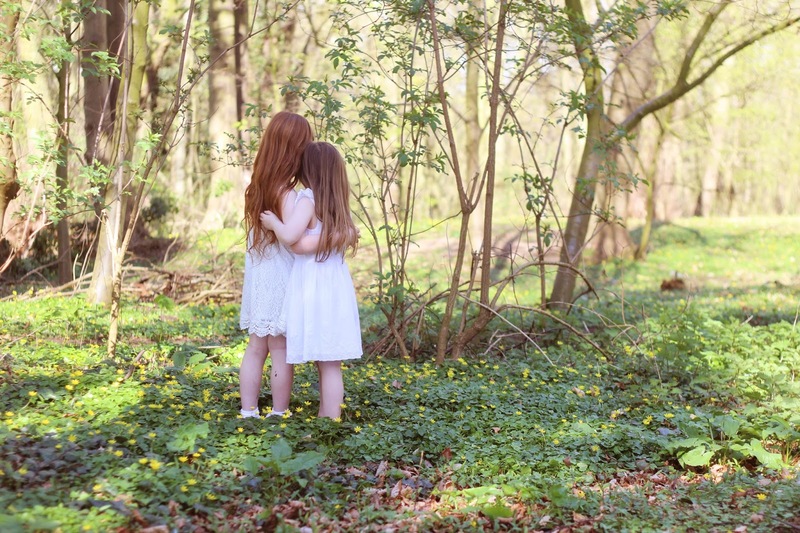 "Siblings" is a monthly link up where myself and 6 other bloggers all share a photo of their children and then we each send you off to look at another blog. You can then go around in a circle, viewing all of the wonderful photographs and then why not link up yourself if you have two children or more! This month, i am sending you over to Katie at Mummy Daddy Me. Her blog is filled with beautiful and enchanting photographs of her two little ladies, LL and Mads. It is definitely one of my favourite blogs! Such lovely pictures of them - real babes in the wood. 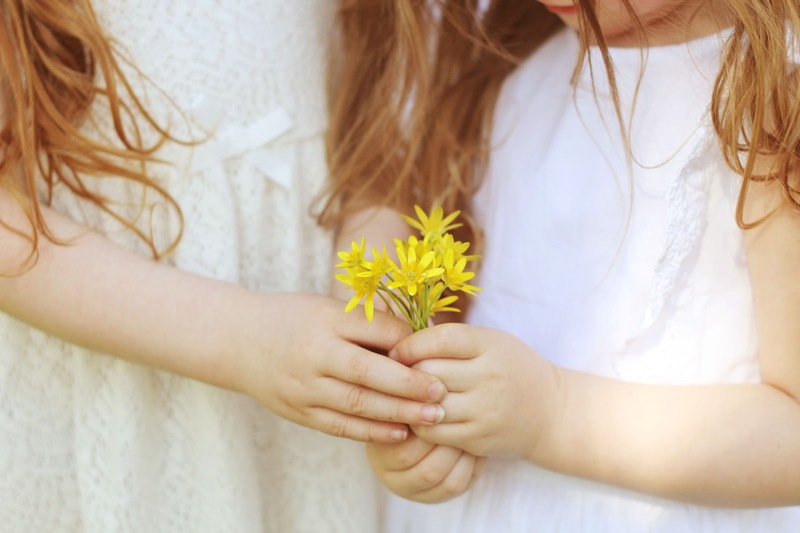 Gorgeous pictures, I love the close up of their hands and the flowers. What absolutely stunning images. How lovely to watch their relationship developing. 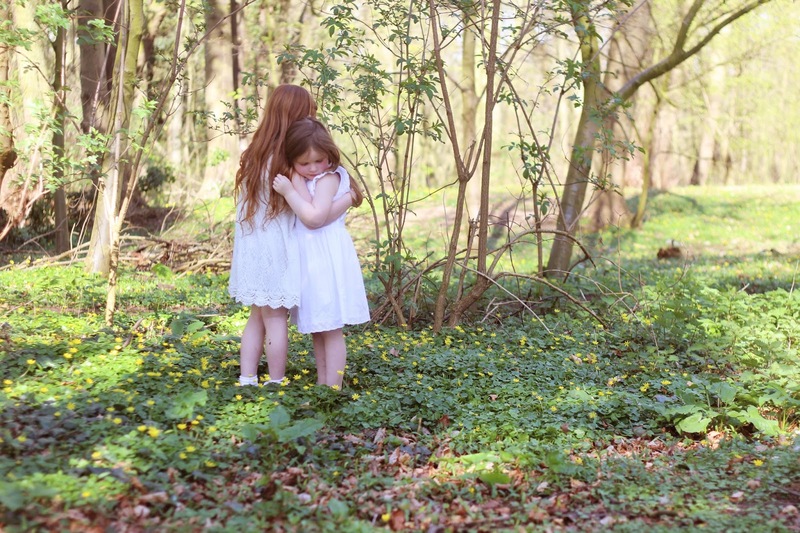 So sweet - they look like two fairies in the woods. Such gorgeous girls. They do look like little fairies in the woods. Oh I love that they scamper at night! My girls do the same but between beds as they're in the same room and they're always amazed that I knew they were up and about! Usually with us it's a foot at the bottom of our creaky stairs and you can hear them running back! I love these photos too - they look like tree sprites that might disappear at a moment's notice! We have cheeky girls! I am sure most siblings do it. I was always sooo amazed at how my mum knew!!! Such lovely photos. I wish I had more then 1 child to join the siblings fun...some days, some days. Your blog is as beautiful as your photos! Your photographs are always so gorgeous, what stunning girls. Gorgeous pictures. Our holiday has been the opposite with 90% of the time spent bickering! Those girls are beauts. White dresses though you are brave. Your girls are so beautiful - I love the colour of their hair it's very striking! I've been meaning to join in with this linky for aaaages - will try to get myself in gear this month! The mermaid hair, the fairy dresses, the whimsical setting, just beautiful!! OH, but these are sheer perfection as always. 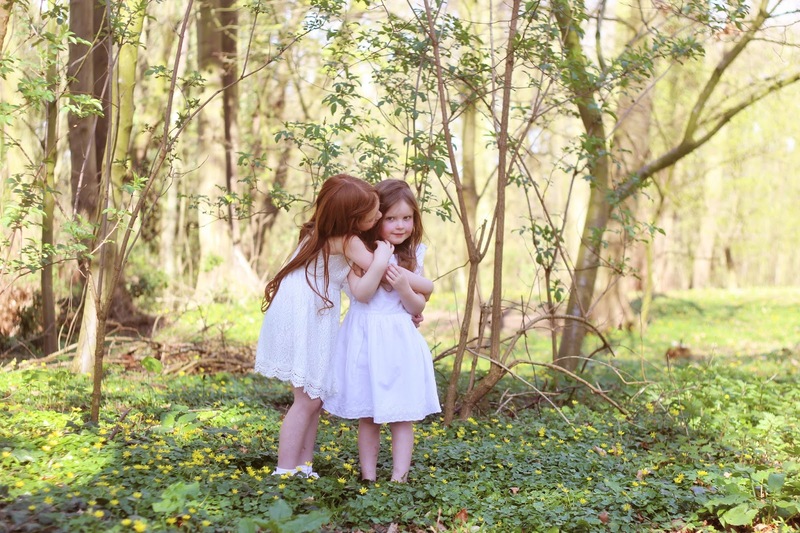 White dresses on little girls make me swoon. Aww so sweet. My three get on really well (most of the time!!) too and I love it - close siblings are the best!! 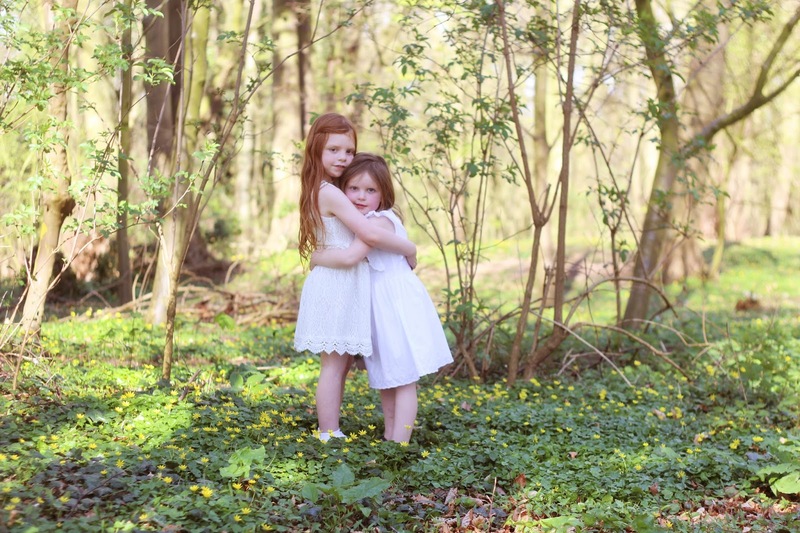 These photos are so beautiful- it's so sweet how they got on so well :) I hope any children I have in the future are as close as your two girls!